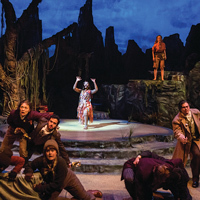 Lara Teeter, head of Musical Theatre in the Conservatory of Theatre Arts in the Webster University Leigh Gerdine College of Fine Arts, was one of three faculty members asked to share their thoughts on letting students learn by failing for a feature in Stage Directions magazine. "Teeter, who is also president of the Musical Theatre Educators Alliance International, says that every student learns differently, so the goal of the program is to allow them to discover, create and evolve." "A lot of kids at this age are trying to figure it all out," he said, something Webster encourages. "We take a cultural view of failure. If you're going to be curious, failure is a huge part of that. People who come here who are perfectionists and have trouble coping with 'failure' haven't been given the tools to understand what the process is really about." The article continues with Teeter sharing general examples of how different students have learned through failure and the openness to trying new things, and the roles teachers play in this process. "It's up to the teacher to find creative ways to engage. "We're looking for an authentic self and voice,' Teeter says.' Preparing the student to succeed after graduating involves developing business and investigative skills, along with taking some practical advice from the teachers who, like Teeter, are still very much out in the professional world." Read the full article in Stage Directions.